Two of the marquee sprinters of this Tour, Fernando Gaviria (Quick Step) and Peter Sagan (Bora-Hansgrohe) chat after going after each other in the first intermediate sprint at Beaulieu sous la Roche. 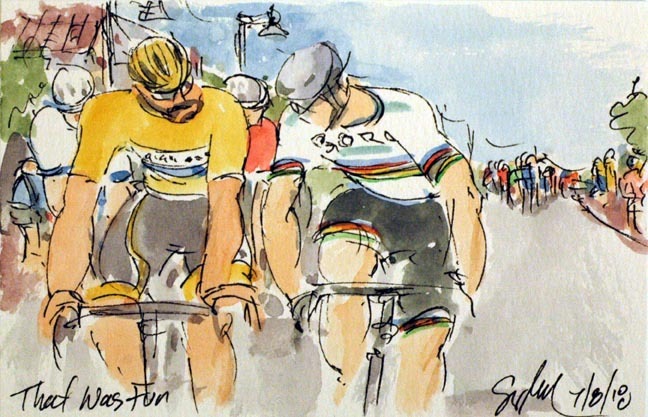 Sagan took the sprint (getting around the Frenchman Arnaud Demare - Groupama FDJ), but Gaviria glued himself to the World Champion's wheel. I imagine that Sagan was letting him know that they would be sprinting for the stage in another hour. And propably let him know he intended to repeat the success then. Or perhaps it was Gaviria just letting Sagan know that he hadn't gone flat out. Peeking over their shoulders are Demare and Alexander Kristoff (UAE Team Emirates) in his European Champion's jersey.